What is Neighbors In Action? neighbors and take action to improve safety and reduce criminal activity in the community. 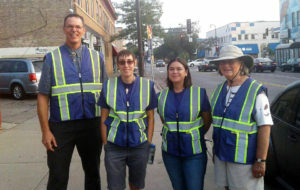 We are a group of volunteers who walk the East Lake Street area and Northrop neighborhood as a positive and peaceful presence. Our schedule is based on the days and times that volunteers are able to participate. We start and end at the Midtown Global Market security desk. If you are interested in participating, please contact us for upcoming dates and times at: info@niamn.org or calling us at (612) 886-3345.